When my three kids were younger, we had a tradition of reading YA fantasy and sci-fi series together. Harry Potter was a big deal for many years, followed by His Dark Materials, Percy Jackson, Hunger Games, and so on. I even read the Twilight series with my oldest daughter, if you can believe it. This shared reading was fantastic. We shed tears, laughed aloud, and had many deep conversations. One thing we kept coming back to—as Mexican-American fans of speculative fiction—was the lack of people of color in most of the books we read (beyond secondary, less important roles). Typically these series boasted a team of what amounted to Anglo young people facing off against European or Western legendary beings, gods, or dilemmas. It was a no-brainer, clearly. Tan obvio. The trick now was to hit on the right story. I was hasta el cuello en research into Aztec and Maya literature at the time, and it occurred to me that a journey through the nine levels of Mictlan/Xibalba (the Mesoamerican Underworld) would make for a great hero quest. I cast about for the right characters for a while, until I started paying close attention to the fantastic friendship between my youngest son and middle daughter. With a few tweaks to age and interests, they became templates for the Garza twins. But who were the Garza twins? What was special about them? Why would they travel through the Underworld? The answers became clear to me one morning when I stepped outside to find a dead jackrabbit in my backyard. An image suddenly overlaid the scene in my head: my daughter, asleep in the grass, the jackrabbit between her hands. I knew in that instant that the twins were naguales, shapeshifters, and the rest fell into place. Once the book was written, it was rejected by many agents and publishers before finding a nice home with the Australian press IFWG Publishing, who treated the project with a good deal of love, even agreeing to allow one of my very talented daughters to design the cover. Reviewers and young readers alike responded positively to The Smoking Mirror, and I was delighted to have added to the body of diverse YA literature. When the request came for us to submit copies to the Pura Belpré Award, I was floored, truly overwhelmed at the idea that these incredible advocates for Latino books would be reading my novel. Then, months later, I got the call from the committee—they’d selected The Smoking Mirror as one of two Pura Belpré Author Honor Books. Very seldom am I at a loss for words—ni en inglés ni en español—but I found it hard to catch my breath and thank them profusely. It’s a humbling yet fulfilling sensation, seeing a project you believe so strongly in get this level of recognition, and I am eternally indebted to all the people who believed in Garza Twins at every stage of its development. Of course, this is only the beginning for me and the twins. Book two, A Kingdom Beneath the Waves, will be out in late April. 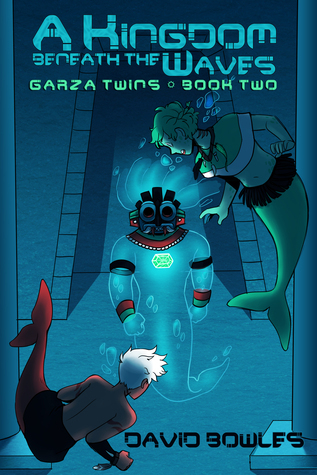 This time, Johnny and Carol Garza find themselves plunging deeply into the Pacific Ocean to stop a renegade prince of the merfolk and his allies—among them the water elementals the Aztecs called tlaloqueh—from recovering the Shadow Stone, a device that can flood the planet. Garza Twins will last for five volumes, and Kingdom ratchets up the tension and stakes, introducing cool new characters and laying the foundation for future conflicts. 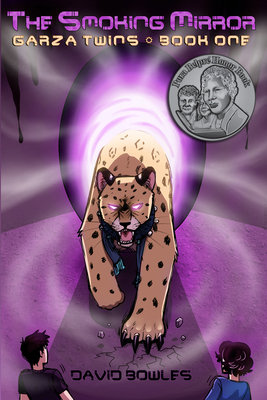 As with The Smoking Mirror, the normal life of the Garza family is explored; the twins grapple with problems facing many modern Latino teens, and the courage and compassion with which they resolve those issues bleed into their supernatural encounters as well. But, as with me in my writing endeavors, they can’t triumph alone. Family and friends are vital to the success of their mission. You see, I think the biggest myth in our culture, and perhaps the most dangerous, is that of the lone hero. Each of us is part of a greater community, a web of support and lore without which we could not survive. If there is a message at the heart of Garza Twins, I think that’s it. Unidos podemos. Together, we can. A product of an ethnically diverse family with Latino roots, David Bowles has lived most of his life in the Río Grande Valley of south Texas. Recipient of awards from the American Library Association, the Texas Institute of Letters, and the Texas Associated Press, he has written several books, most notably the Pura Belpré Honoree The Smoking Mirror. His work has also been published in venues such as BorderSenses, Strange Horizons, Apex Magazine, Stupefying Stories, Asymptote, Translation Review, Huizache, Metamorphoses and Rattle.